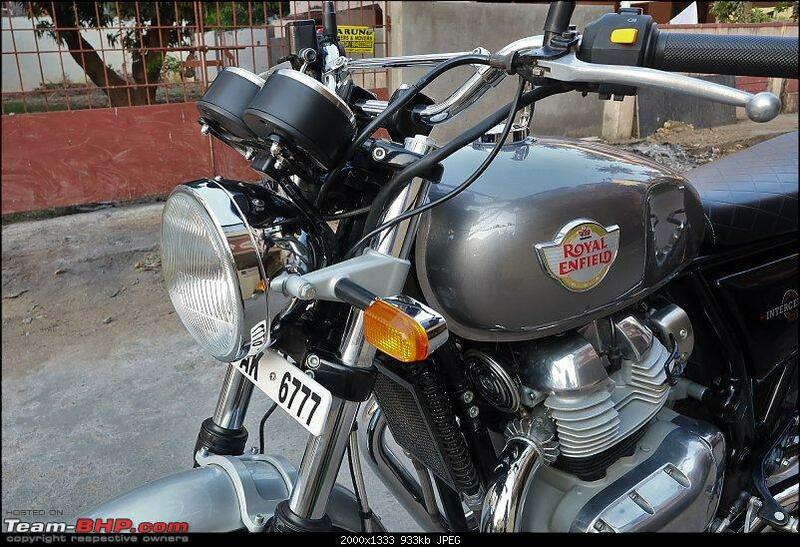 This is the ownership log of my Royal Enfield Interceptor 650 Twin. Will update regularly and keep this thread live and active. Retro styling from the 1960's stays true in its overall design. Sweet exhaust note exhibits strong character, has a nice burble at idle and rumble at speed. Engine is smooth. Torquey in city and relaxed on the highway. 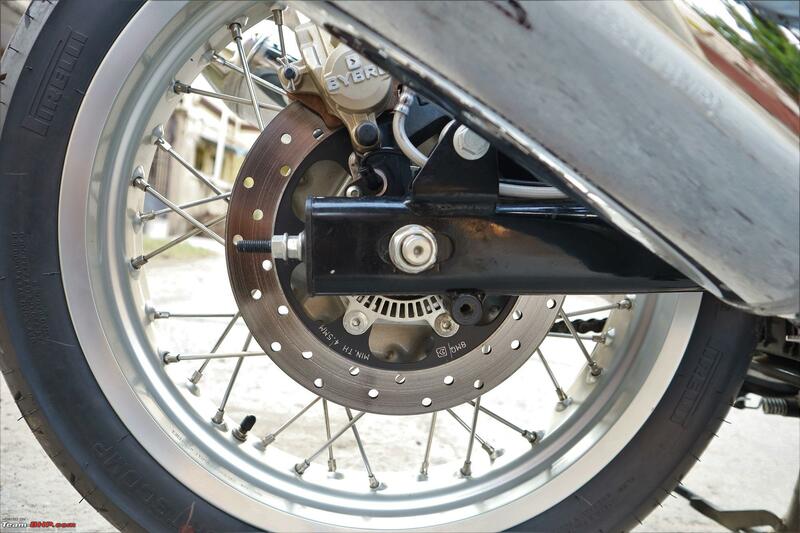 Excellent brakes and Pirelli tyres combo offer impressive stopping power and feedback. Comfortable riding posture for long distance touring. Feels heavy to get off the stand and push. Wire spoke wheels with tubed tyres are prone to punctures and flat tyre. Niggles list is getting longer everyday as more bikes get delivered. Soft seat starts to feel uncomfortable after 30mins of continuous riding. I started riding motorcycles in the year 2004 as my daily commute to college. It was a Hero Honda Ambition 135, neat bike and clocked close to 50k kms when I traded it for a Yamaha FZ16 in 2008 which then became my daily commute to office until 2015 after which the Alto K10 AMT took over the daily office commute duty. The Yamaha FZ16 is a great motorcycle in its own way, amazingly flickable, telepathic handling and stimulates the urge of scraping the foot pegs on every possible curve. 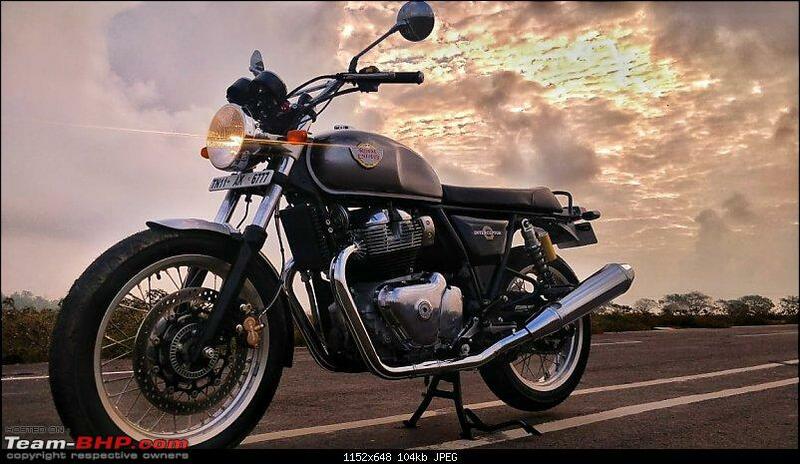 Have done few interstate road trips in the FZ, the longest being the Chennai-Goa-Chennai. 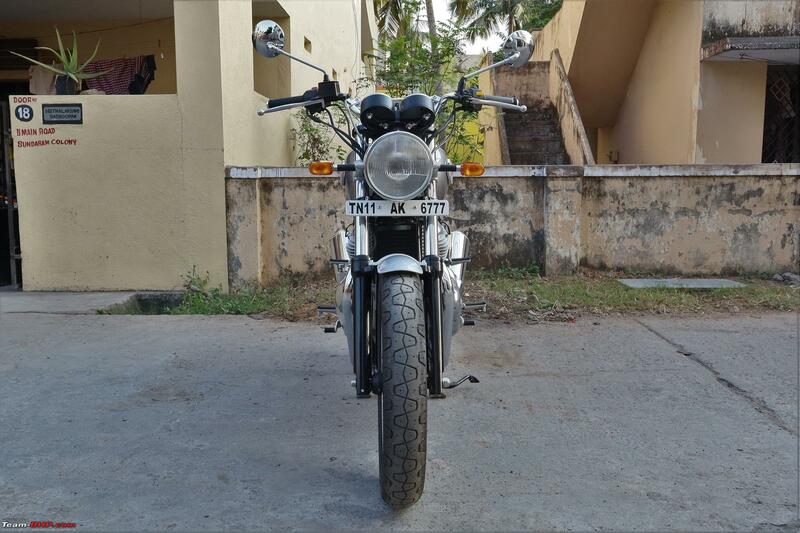 I still have the Yamaha with me, clocked over 1,10,000kms and rarely being used now and needs a complete overhaul to bring it back to its original glory, which will happen someday. We had few other motorcycles at home, first gen Apache RTR160, first gen KTM RC390 and currently the Kawasaki Z250 primarily used by my brother. My love for motorcycles started long back form watching and fetching tools for my uncle as he regularly worked on his motorcycle and did engine rebuilds at home. I like to get my hands dirty with my motorcycles and over the years I've learnt a thing or two about motorcycles and do my own maintenance, servicing and replace components. 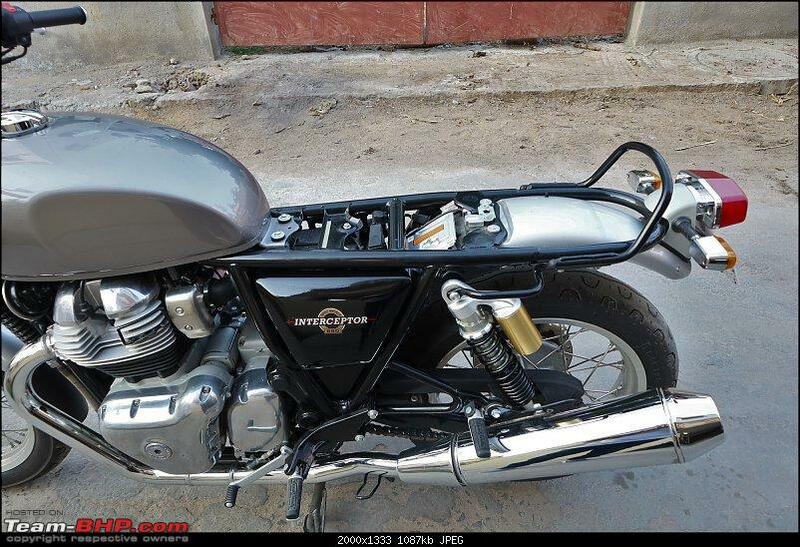 It was early 2018 and I said to myself that I should buy my last motorcycle, for the love of motorcycling, a motorcycle with loads of character, simple mechanicals, timeless design and that’s when I for the very first time shortlisted a Royal Enfield, the Standard 500. 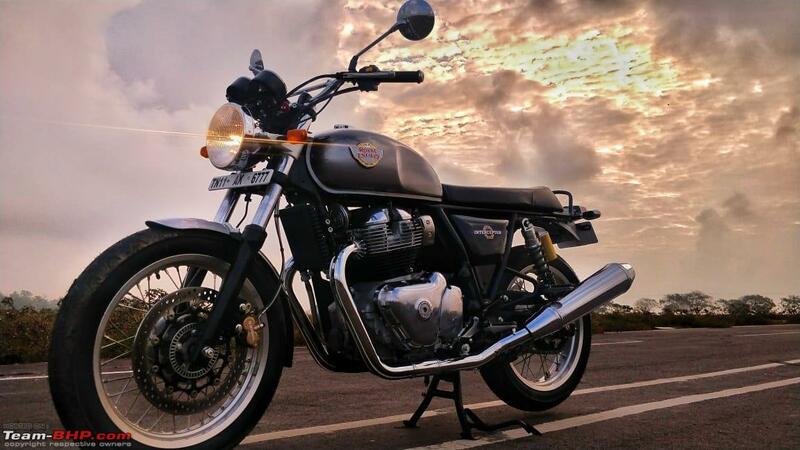 I was not a Royal Enfield guy and when I disclosed my decision to my friends, I was given all sorts of advice and examples to rethink my decision but I knew what I wanted. My usage is limited, ride to office a couple of days in a week, weekend errands and occasional long-distance rides. In short, it's a 100% heart over mind decision. Mentally prepared myself for the niggles and constant attention the 500 will bring along to the table. 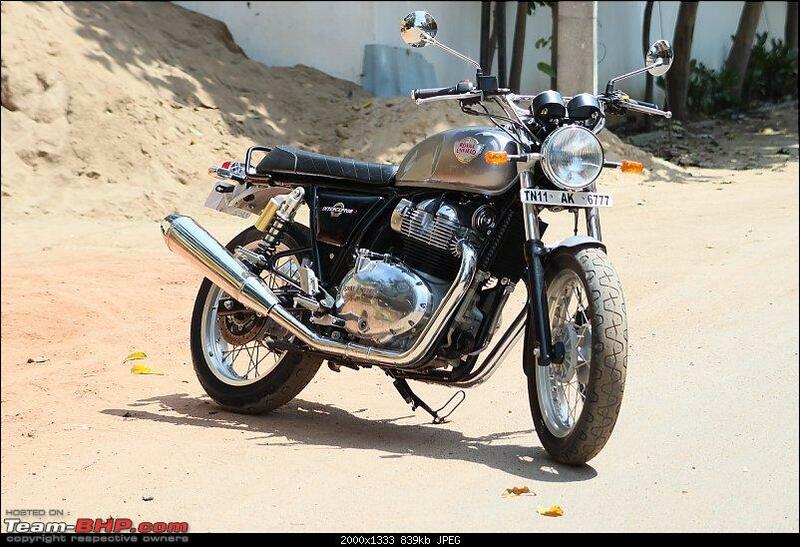 I was in no hurry and took my own sweet time visiting dealerships and took test rides, it was already mid-2018 and this is when the news about the 650 twins and the Jawa started cropping all over the internet. 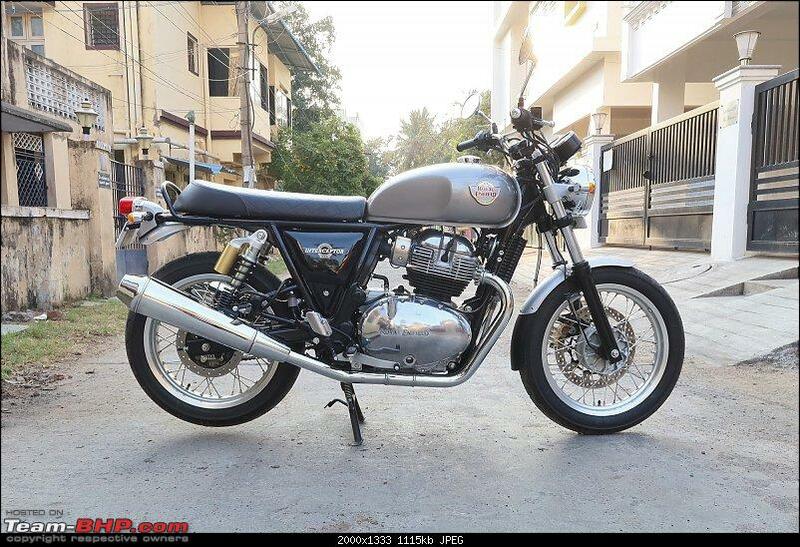 I liked the retro looks and the specs but I had no interest for the 650 thinking it will be priced above the Rs 5-lakh mark which is way over my budget and for the next few months I got busy with family commitments and delayed the buying process. The Interceptor grabbed my attention again during the California media drive in September 2018 with its timeless design, minimal electronics, specs and the lineage. The media went gaga over the 650 twins and I liked what I saw but still wasn’t convinced on the pricing part so decided to wait and watch. Come November 14th, got hooked to the live stream with my fingers crossed and then came the awesome pricing and that sealed the deal. No second thoughts, the very next day I went ahead and booked myself an Orange Interceptor at the Adyar RE Brand showroom in Chennai. 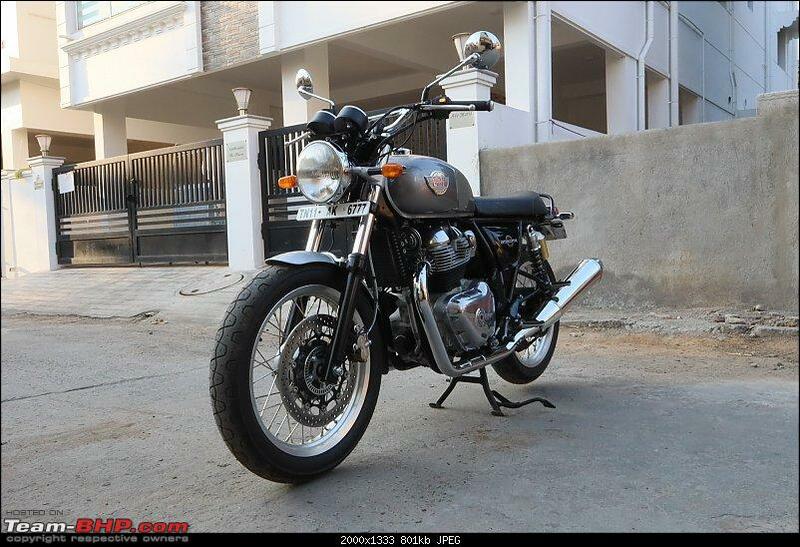 Had couple of exciting test rides during the month of December from two different showrooms. In the mean time I changed the color to Silver since the Orange started to look a bit loud and felt the subtle Silver will age better. In mid of December I was informed that my bike will get delivered around the first week of February and I am happy it did so. 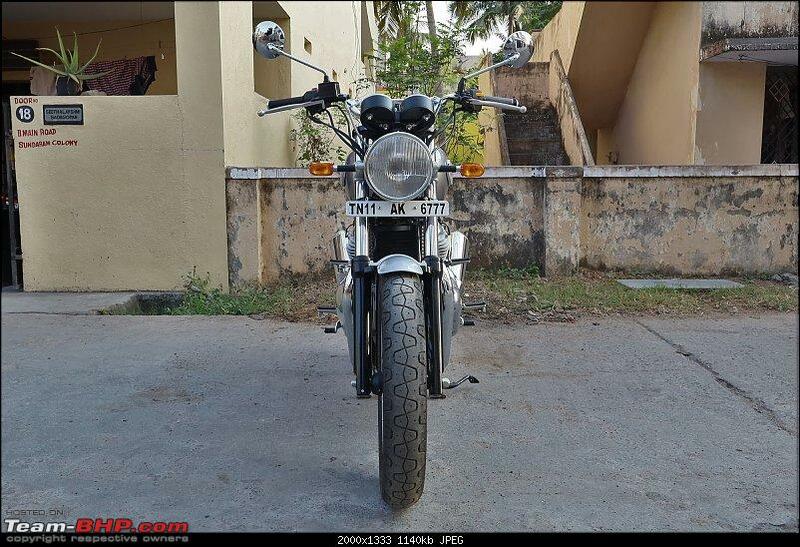 The bike was invoiced on 4th February and I did the PDI on 5th and got it registered the next day and took delivery on 8th February. The bike is January 2019 manufactured. The sales person gave me the option to choose Comprehensive or Nil depreciation cover from insurance providers such as New India, United India, Oriental, ICICI and Reliance. Overall booking and delivery experience were smooth at the RE Adyar Brand showroom Chennai without any unreasonable delays or false promises. The showroom manager and staff were friendly throughout. Last edited by Torino : 21st March 2019 at 12:50. This is the first Royal Enfield in our family, and everyone was excited, but I set my bar low and prepared for any unplanned surprises right from day one. 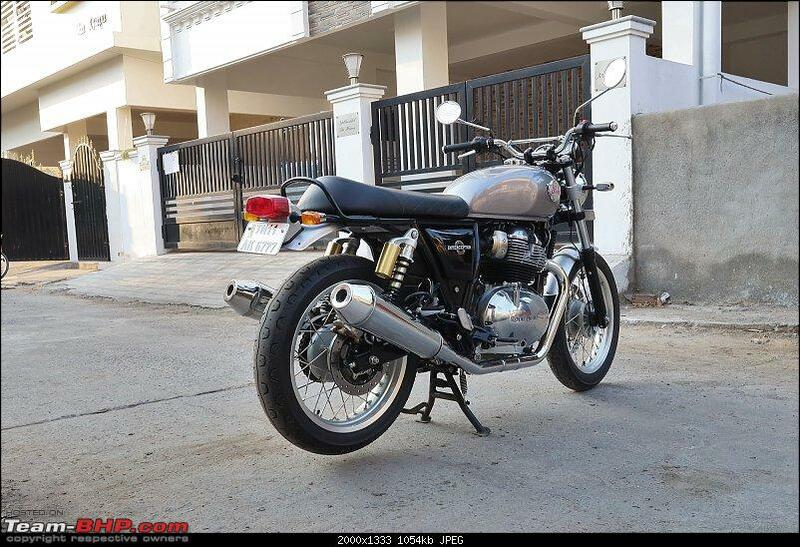 This is a motorcycle built to a price and over the years from the internet and friends who own and owned RE’s, I gained a fair bit of knowledge and understanding about the living with a Royal Enfield. Saving grace is the 3-years/40,000kms warranty and 3-year free Road Side Assistance. ‘Cultural Icon from the 1960s’, ‘Easy got back’ are tag lines for this RE, the retro styling from the 60’s may not go well with everyone, in fact some folks wish the 650cc engine was poked into the RE Classic. To each his own and yeah looks are subjective. 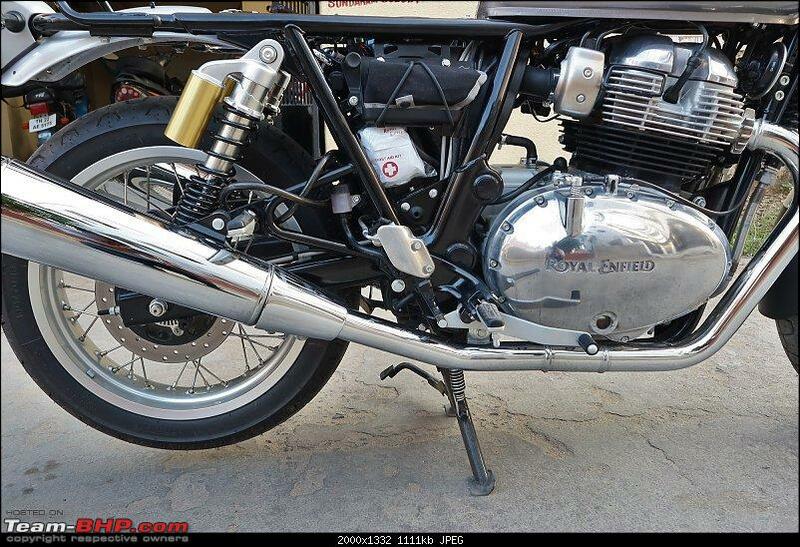 Funny thing is, so far 10/10 people at traffic lights and other public place ask me if this is a Jawa because of the twin exhaust pipes and when I say this is a new Royal Enfield, they say ‘oh, so RE has copied twin silencer from Jawa’, Sigh!. I like the clean and simple looks, perfect styling in every possible way I could imagine. The Silver Specter looks subtle and understated and doesn't attract attention so easily and I think this silver color goes rather well with the rest of the retro theme. Happy that RE stuck to the original classic lines and gave us this modern classic roadster. 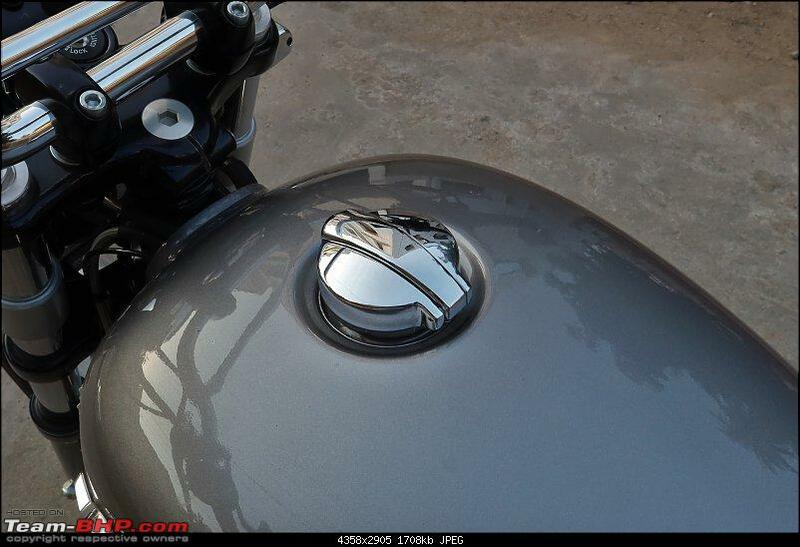 Especially like the unique styling cues which emphasizes retro, such as the Monza style fuel filler cap, Brushed Aluminum rims, Upswept twin exhausts and the Handlebar Brace. The overall paint quality and chrome appears to be top class and I may have to invest in a good chrome/metal polish and spend quality time to make them last. The Pricol made instrument console has all basic info but I miss the clock the most. 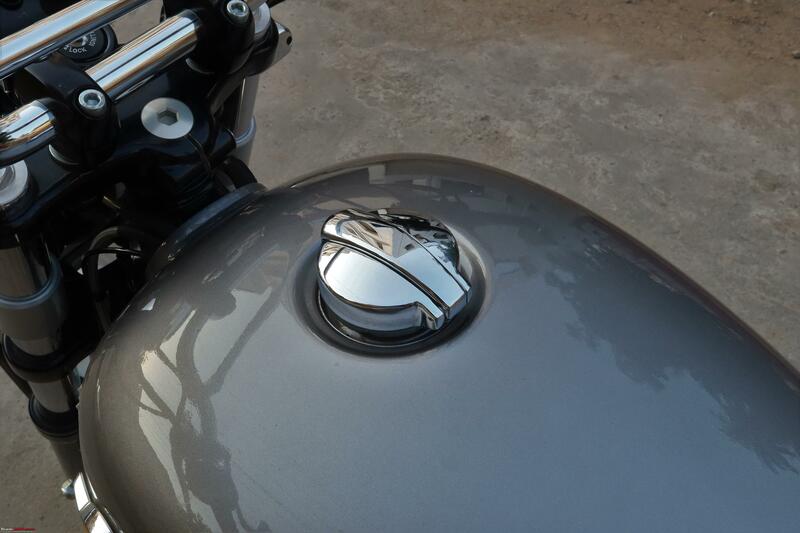 I think the fuel indicator’s erratic behavior is due to the tank’s sculpted design on the outside and inside. I have observed this drastic drop at certain fuel level in all my previous motorcycles and it takes time to understand this and predict the amount of fuel left. The headlight, indicators and side view mirrors are made by Fiem and they are well put together. 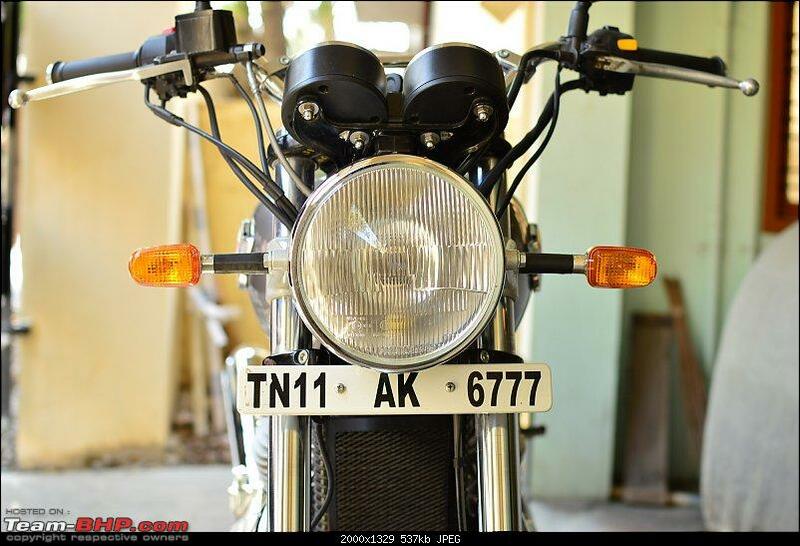 The headlight has decent throw and spread but it has its limitations without the clear lens cover. I had to adjust the headlight to bring the focus completely down to the road. If I have to do some nit-picking on the design it will be the fat exhaust, I think the slimmer and sharper aftermarket exhausts look much better. No, I will not be replacing the stock pipes and I’d like to keep the bike completely stock at least for the first few years, especially the exhaust, I am not a fan of those loud aftermarkets'. One thing which I hate is the always headlight ON function, I wish at least the light turns OFF with the engine kill switch. I get this OCD of drained battery and not able to crank even for those few seconds at traffic lights. 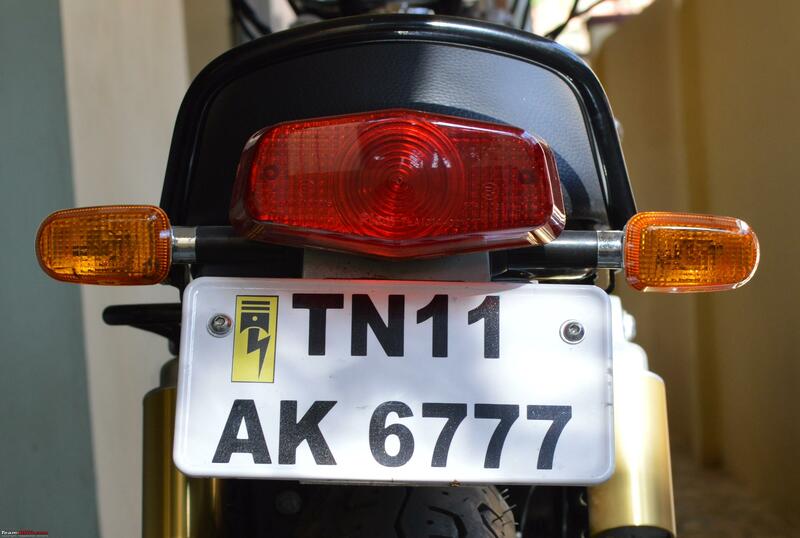 The rear black mud flap and the saree guard were complete eyesore and they had to come off on day one. Can't really go wrong with the 1960's styling. Quality of paint and chrome looks and feels top notch. The retro charm is evident no matter how you look at it. Twin exhausts defines the rear. The large 320mm front disc brake assembly and the fat exhaust are the only interesting bits when viewed from the side. 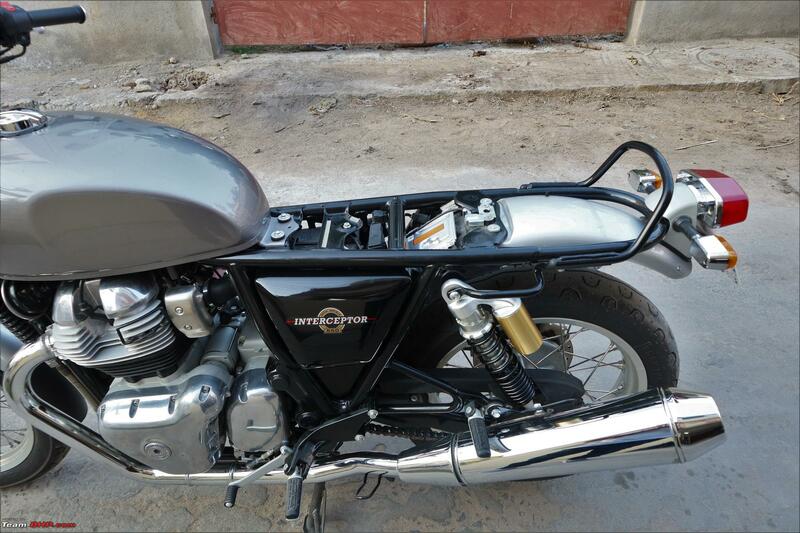 The exposed steel tubular double cradle frame may look rudimentary but is designed by the UK based chassis specialist Harris Performance, now a unit of Eicher Motors Ltd. The back to basics front fails to catch any sort of attention. As simple as it can get in this day and age! In contrast to the front, the twin exhausts rear is an attention grabber. Creates curiosity among onlookers as they come up with the 'Is this the Jawa?' question. The rear three quarters is my personal favorite angle. Mud guards and the side panels are the only major plastic parts in the bike. Torquey, relaxed and easy are the three simple words to describe this air cooled 648 cc inline parallel twin engine. It has loads of low-end torque and it is evident right from the moment when you release the clutch. 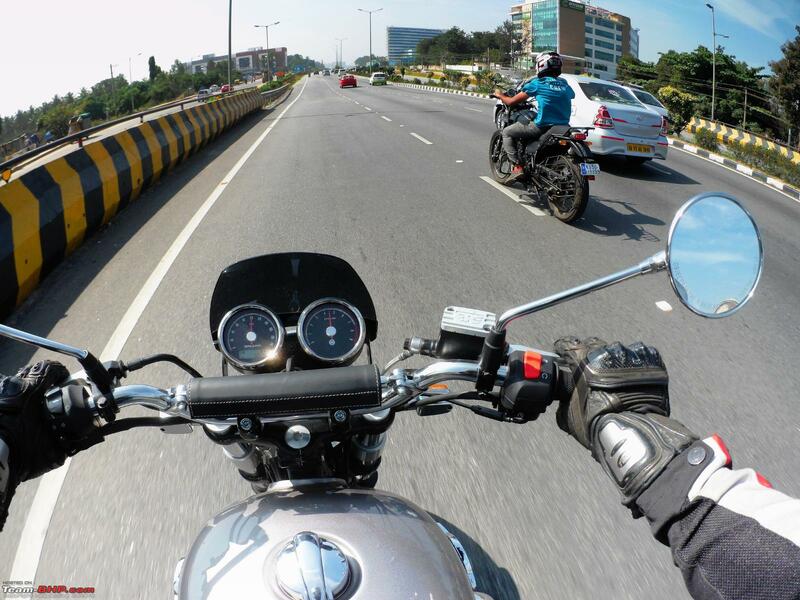 The motorcycle surges ahead like a locomotive in a steady and linear manner in such a way that it is hard to stall this motor when getting off from standstill. NHV is minimal as you would expect from a parallel twin and it stays smooth across the rev band. The combination of the low compression ratio of 9.5:1, 7500 rpm redline, tall gearing and the muted bass heavy exhausts means the engine always sounds and feels relaxed and you never get the sense of urgency even when you are in a hurry. The Bosch EFI system delivers precise fueling and crisp throttle response. I’ve heard the horror stories about the Classic 500’s FI going bust, note to self: never run the bike in low fuel. Low fuel warning comes on at 2.9L. 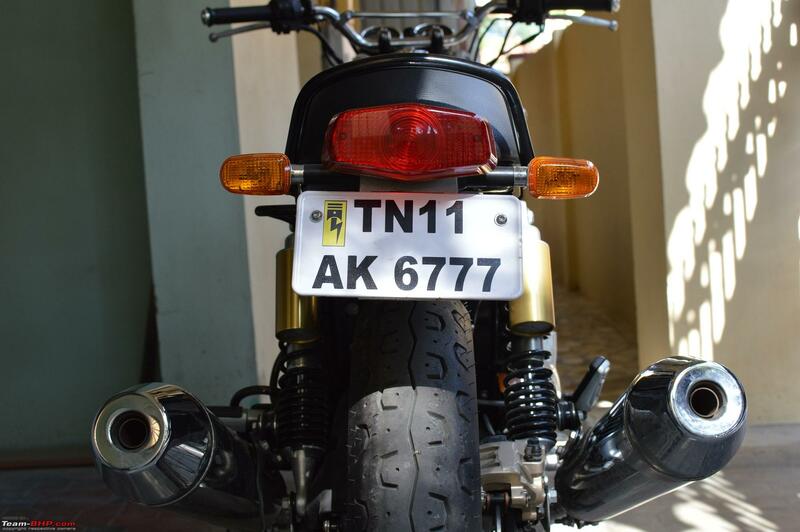 The exhaust note adds a unique character to the motorcycle, and I love the nice burble at idle, the rumble at slow speeds, the faint thump over 3000rpm and also the engine whine and burble while decelerating. 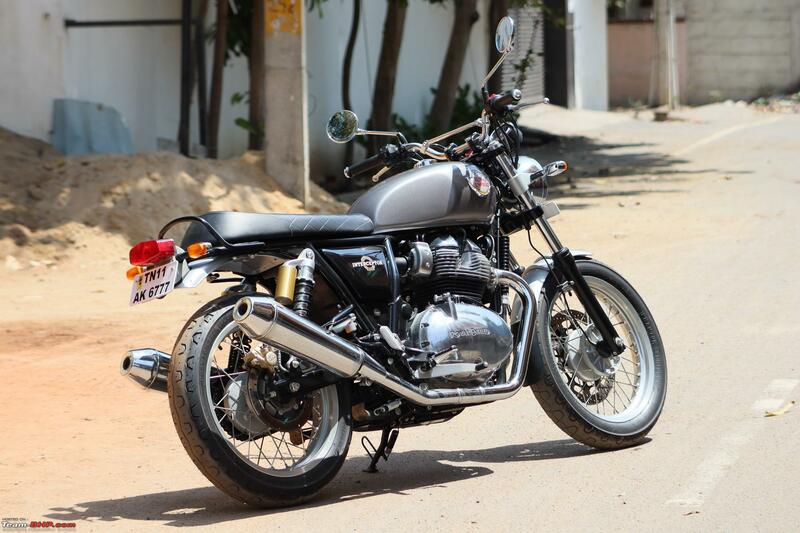 The up-swept exhaust makes sure that the rider is always treated with that sweet note. Engine heat is pretty much noticeable and makes its presence felt when idling after a 20 minute ride and me wearing a pair of jeans. It feels like standing between two idling cars in traffic on a sunny day. 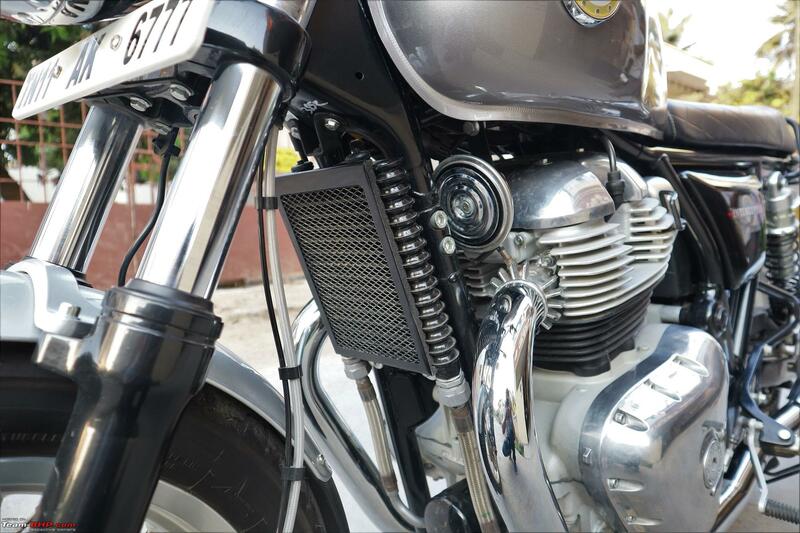 Engine heat is acceptable since it’s a 650cc air-cooled engine. 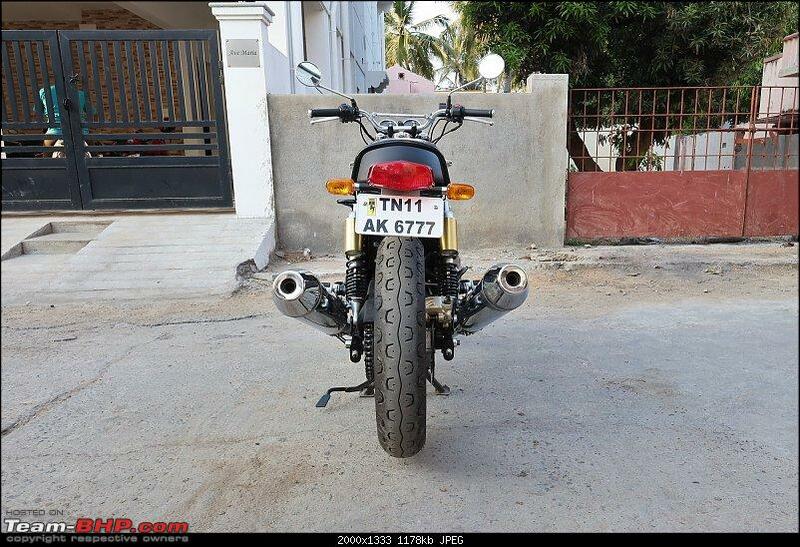 47 horse power is enough to propel the near 213kg motorcycle to a top speed of 170+kmph. That said, 47 bhp is just about adequate and may not feel intimidating or quick as some smaller motorcycles, rather it manages to keep the rider smiling in most situations with its nice in-gear acceleration and tall gearing. My experience with fast motorcycles comes from the KTM RC390 for a brief period of two years and the Kawasaki Z250 at present hence I cannot compare with bigger and more powerful motorcycles out there. The 6-speed gear box is good but isn’t very slick or precise, I did encounter few false neutrals and loud shifts from N to 1 in the initial days, hope it improves over time and usage. 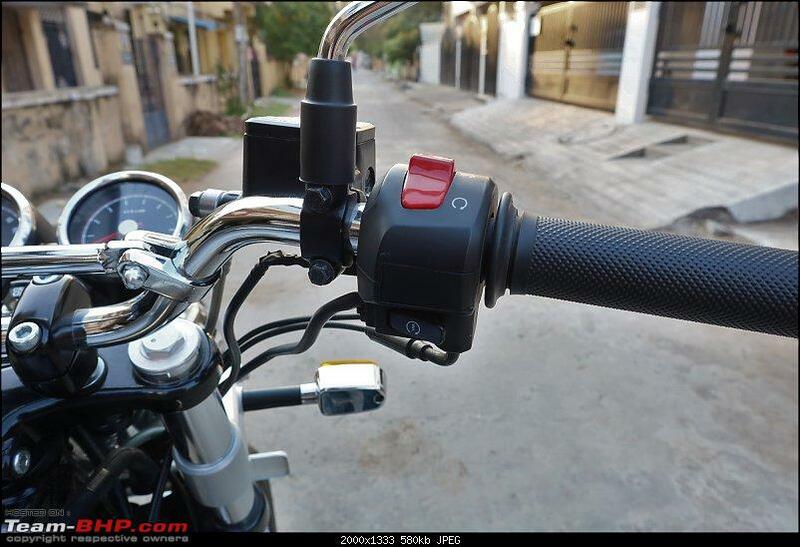 Otherwise the slip assisted clutch lever feels light and makes life easier in b2b traffic. 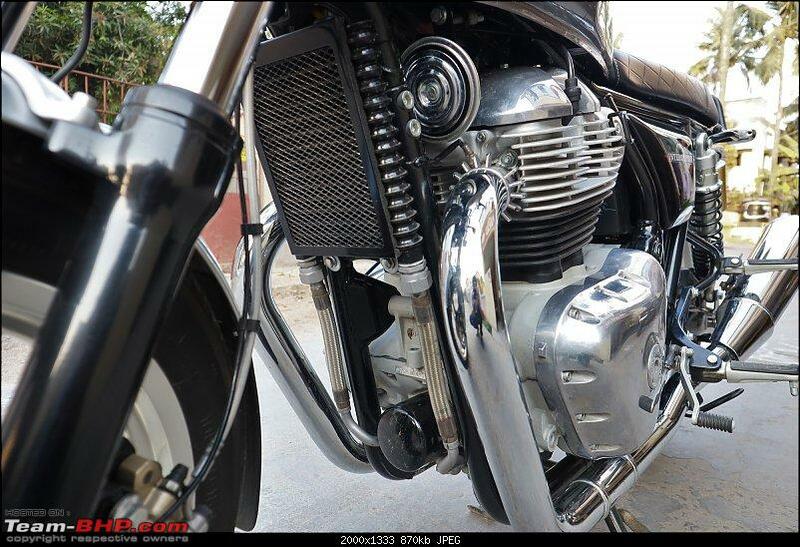 In 6th gear it does 80kmph@3200rpm and 100kmph@4000rpm. RE recommends 91 RON unleaded petrol. I think all fuel stations have shifted from 87 to 91 RON petrol after BSIV implementation. Recommended engine oil grade is SAE 10W50 API SL JASO MA2. Capacity is 3.9L@dry fill or 3.1L@refill. 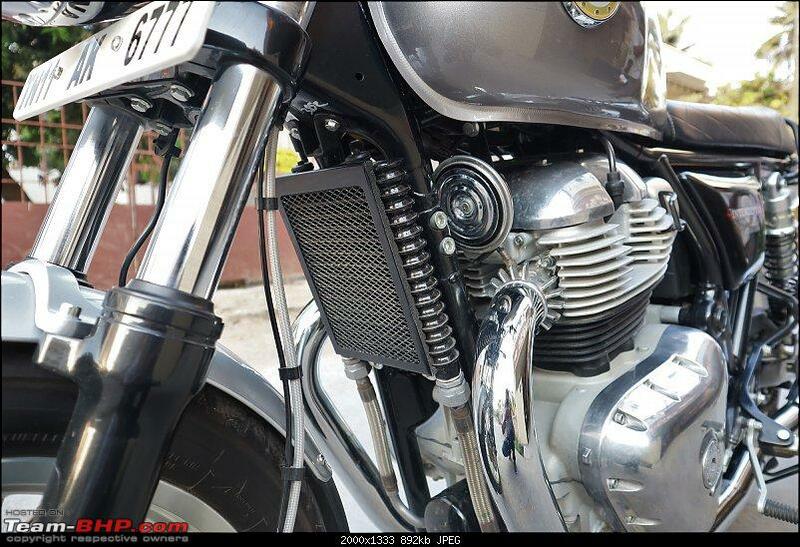 The steel Oil Cooler guard from factory is a nice touch. The twin horns from Minda sounds good. Sump Guard in the RE accessories list is still out of stock at the dealership. Notice how much the gear box case protrudes outside. The fat exhaust, wish it was slimmer and sharper. Has sweet exhaust note though. 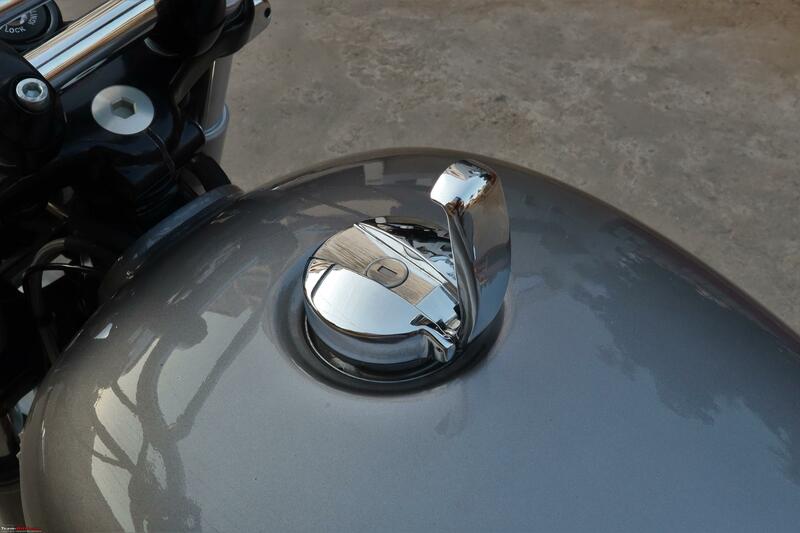 The rear pillion grab handle is welded to the frame, ensures a firm grip when handling the 210+kgs. There is no under seat storage space of any sort. You can slide in the vehicle documents there. The LHS side panel is fastened by screw. ECU and fuse box for easy access. The RHS panel can be removed using the ignition key to access the seat release knob. 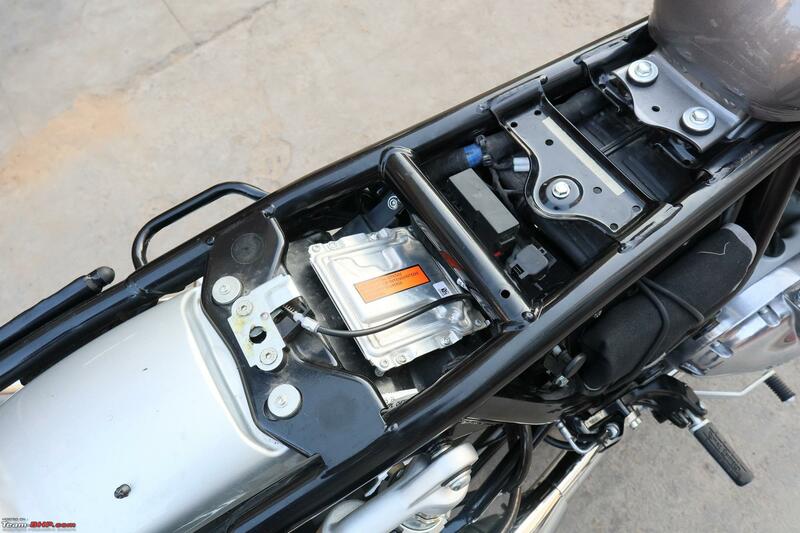 12V 12Ah VRLA (valve-regulated lead-acid) battery is concealed behind the tool kit and the first-aid kit pack. Last edited by Torino : 21st March 2019 at 12:51. The 100/90R18 front and 130/70R18 section rear may sound under-tyred for a 650 but with the fairly sticky Pirelli Phantom Sports Comp feels good and never felt the need of extra rubber be it cornering or hard braking. My only concern here is the wire spokes wheel set up which attracts unforeseen puncture and with the several ongoing construction projects all over Chennai things doesn’t look encouraging. Had my fair share of heart in my mouth moments already when going past every flyover or Metro rail construction. In the braking department, the front wheel has a rather interesting set-up. 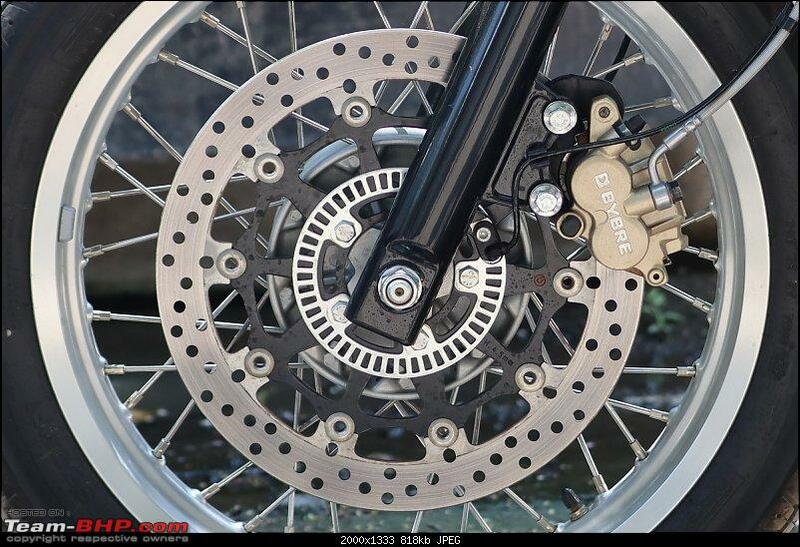 A 320mm floating rotor riveted to the Aluminium alloy spider from Brembo with the 2-piston caliper from Bybre provides commendable stopping power and excellent feedback. The rear is equipped with 240mm disc with 1-piston caliper from Bybre. The overall excellent braking feel and feedback is complemented by the steel braided lines at both the ends and there is the 2-channel ABS from Bosch for added safety. From my earlier motorcycles I have developed this habit of using just the front disc brakes on most situations but in the Interceptor though the front end tends to feel bit heavy under hard braking thanks to the weight of the motorcycle I presume, must unlearn and relearn my braking skills with Interceptor. The near 213kgs of weight makes its presence felt when getting off the stand and pushing the bike out of my narrow parking space. 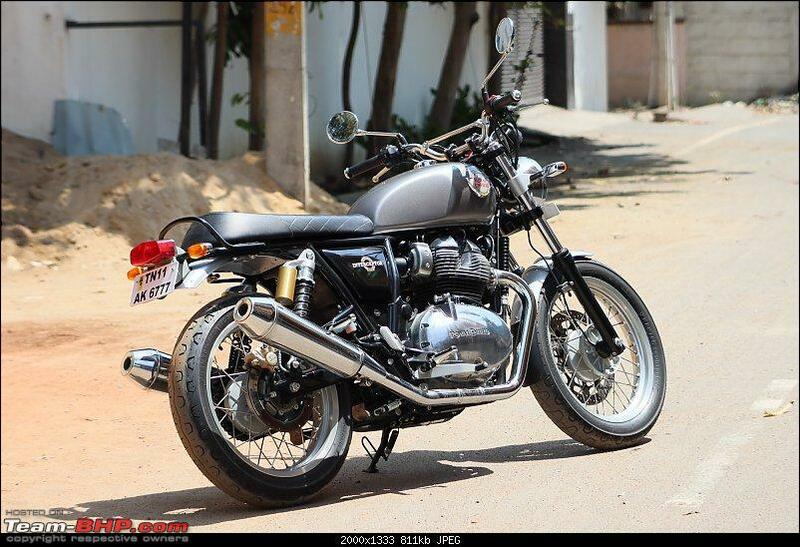 The bike doesn’t feel heavy once you are on the move and feels right at home riding through traffic and narrow lanes. My height is 5.7ft and the rider foot pegs intrude whenever I get my feet on the ground, I’ve improvised this by keeping my feet ahead of the foot pegs. The foot pegs itself is slightly rear set and this helps. I rode pillion a couple of times for a brief distance and here is my observation on the pillion seating comfort, the seat is soft and sinks in deep, the tapered seat end compromises space and gives a feeling of sitting on the edge and no space to move around, due to the upswept exhausts the pillion foot pegs are set high and a bit forward which ends up sitting with your knee pointing skywards. Handling is neutral and the Pirelli tires help a lot during quick directional changes. From the factory the handlebar and levers were off set for my liking hence soon as I got home after delivery out came my tool box and the handlebar was pulled towards the rider and the clutch and brake levers were slightly pulled down also set the rear suspensions to its softest setting. 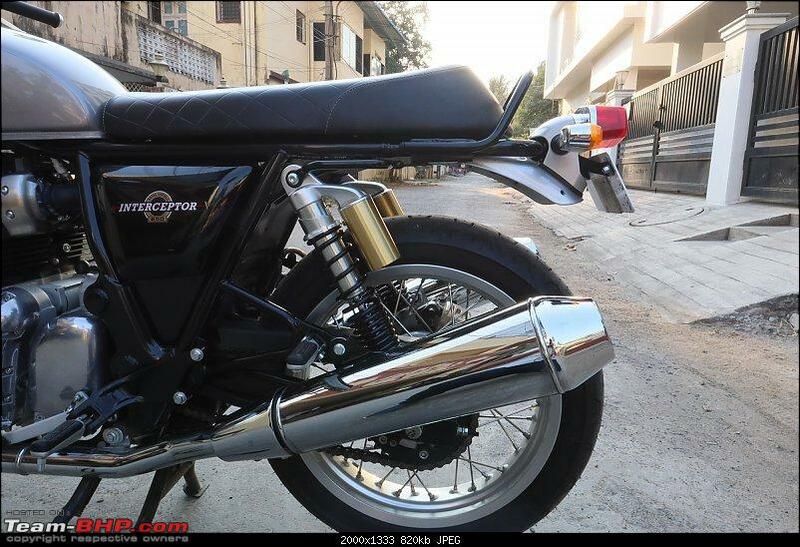 The seating position is straight forward with the upright handlebar and the commuter-ish foot peg position and you can quickly find a comfortable position without much hassle and the posture is perfect for long distance cruising but the seat itself is soft and narrow and wears out your bottom soon. 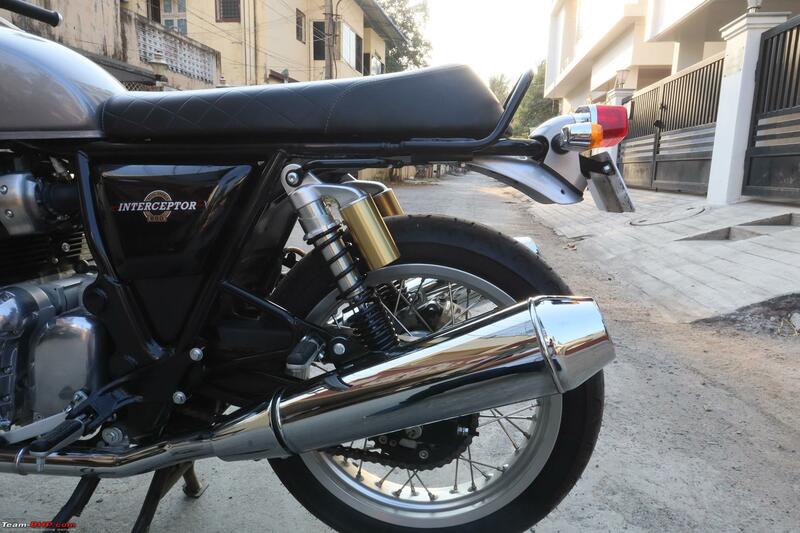 The fiddling rider foot pegs will be an unending discussion because of the wide engine and gearbox and I don’t think there is any solution for this and so does RE. Swapping with the Continental GT’s footrest set up is an option but I don’t think anyone has done it so far and not sure how comfortable or uncomfortable the riding position will be. 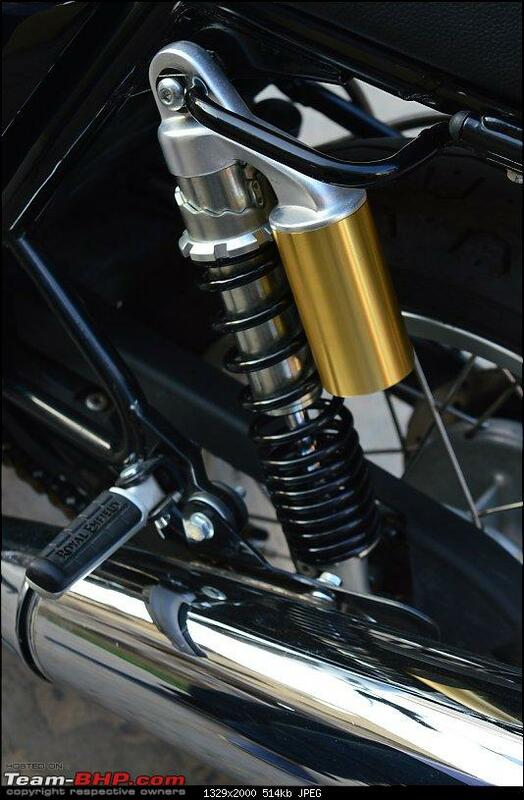 If you are close to 6ft and above the foot pegs won’t bother you at all. For me though, I have decided to get used to it and live with it. The front brake set-up not just looks nice but has excellent bite and feedback. You can notice the red Brembo logo on the black Aluminium alloy spider. 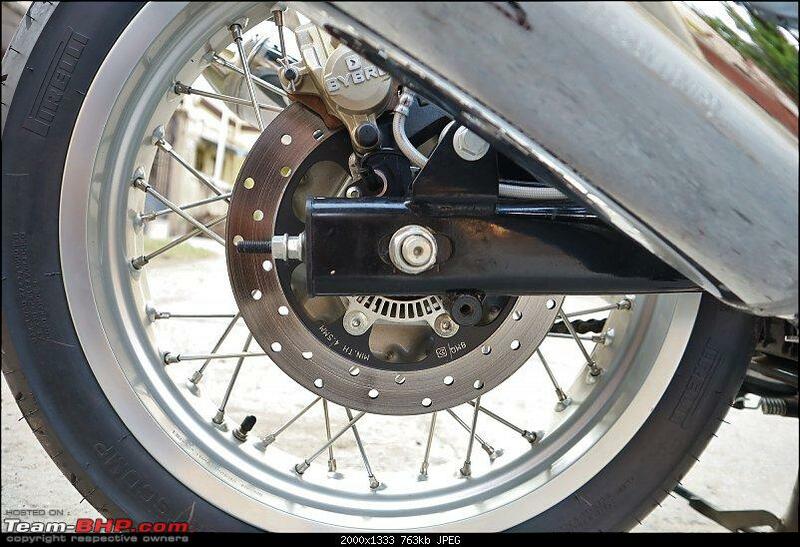 No complaints with the 240mm rear disc with single piston caliper. Prismatic glass lens cover for the headlamp offers decent illumination for in-city commuting. 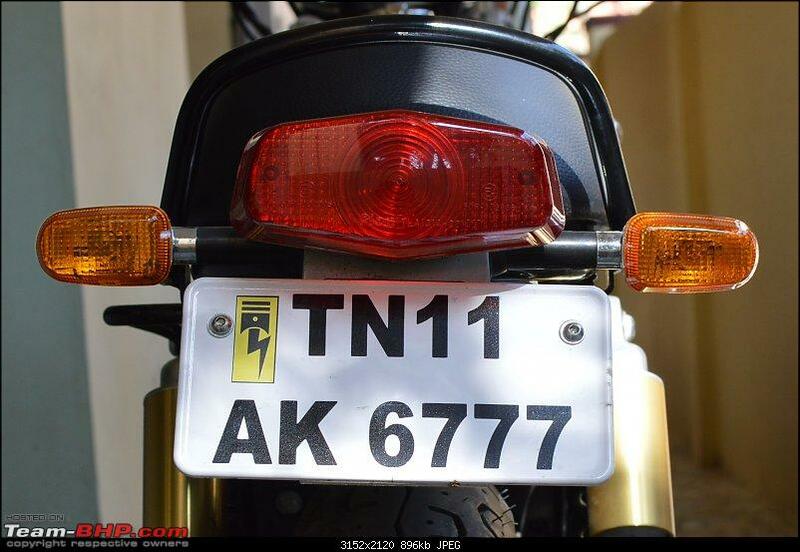 The tail light along with the indicators looks classy yet functional. No complaints here. Another shot of the eye catching rear end. The rear gas charged single coil-over shocks has 88 mm travel. I have set it to its softest setting. Closer look at the rear coil-over shocks and the gas charged canister. The twin pod instrument cluster has all the basic info and tell tale lights. Major missing are the clock and gear position indicator. 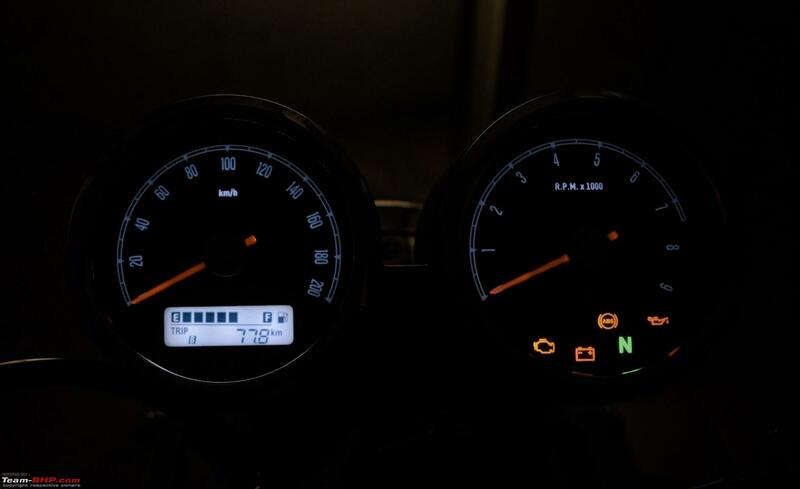 White back light offers excellent legibility at night. The wires, cables and electrical connectors get busy behind the headlamp. There have been few complaints of the engine shutting off abruptly, believed to have happened after a high pressure water wash near the headlamp area. Switch quality is good and easy to operate. I want to get rid of this always headlamp ON function and fit the good old headlight switch. 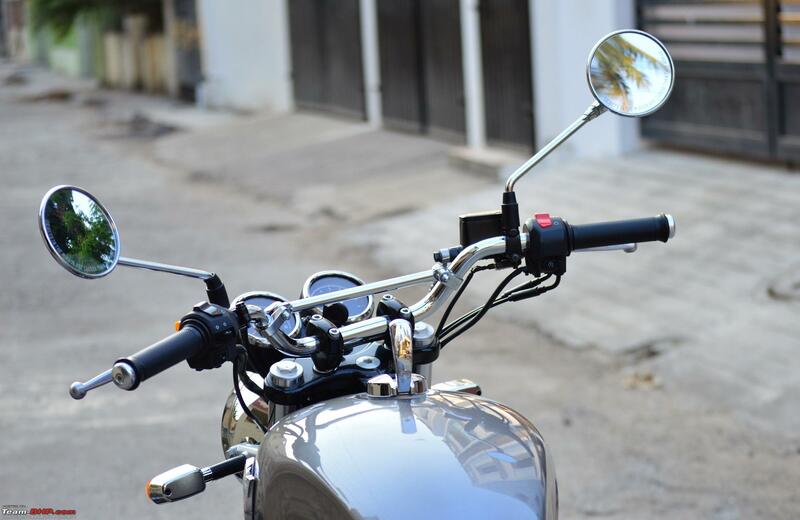 Handlebar brace adds to the retro charm. Monza style fuel filler cap, popular on racing machines in 1950's and 1960's. Another shot at the Monza style fuel filler cap. Moving thread from Assembly Line to Motorbikes forum. Thanks for sharing, Deepan! Congrats Deepan. 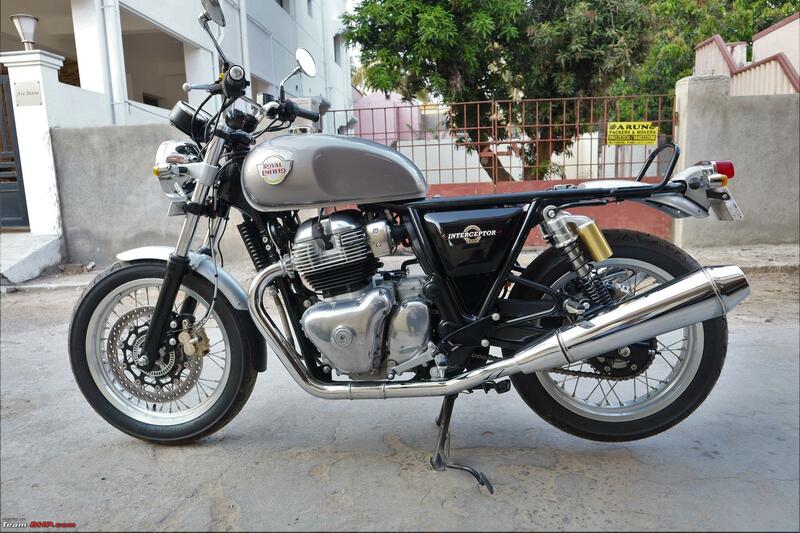 Excellent report of a lovely motorcycle. 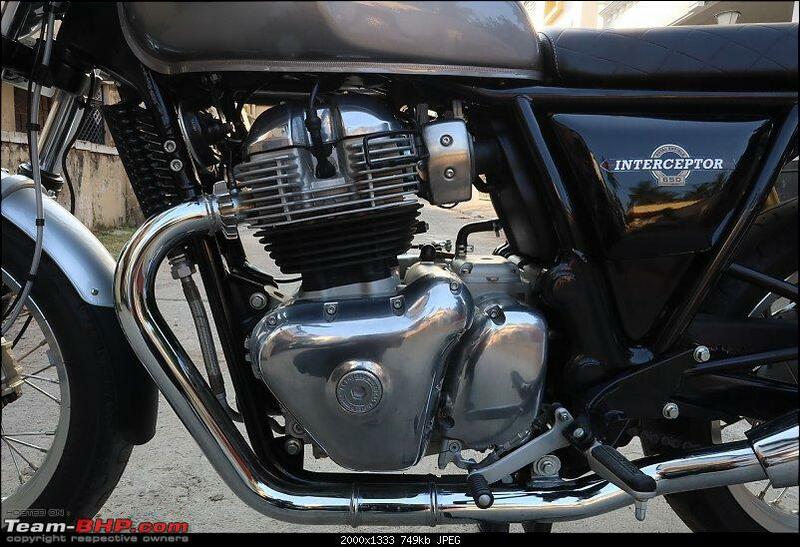 Love the Interceptor 650 for what it offers at that price point! 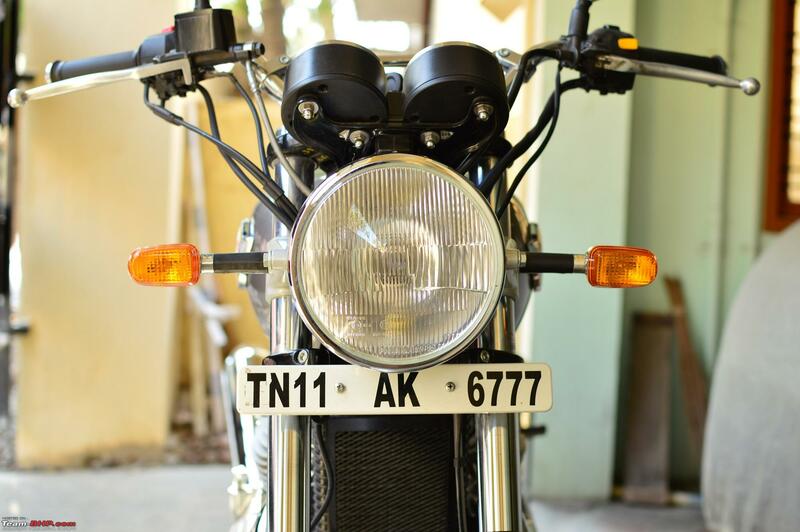 I still have the Yamaha with me, clocked over 1,10,000kms and rarely being used now and needs a complete overhaul to bring it back to its original glory, which will happen someday. Hope you get to restore the FZ to its former glory soon. Also, the Kawasaki Z250 - Hope you will share that experience on a relevant thread - a rare motorcycle, that one! The 6-speed gear box is good but isn’t very slick or precise, I did encounter few false neutrals and loud shifts from N to 1 in the initial days, hope it improves over time and usage. 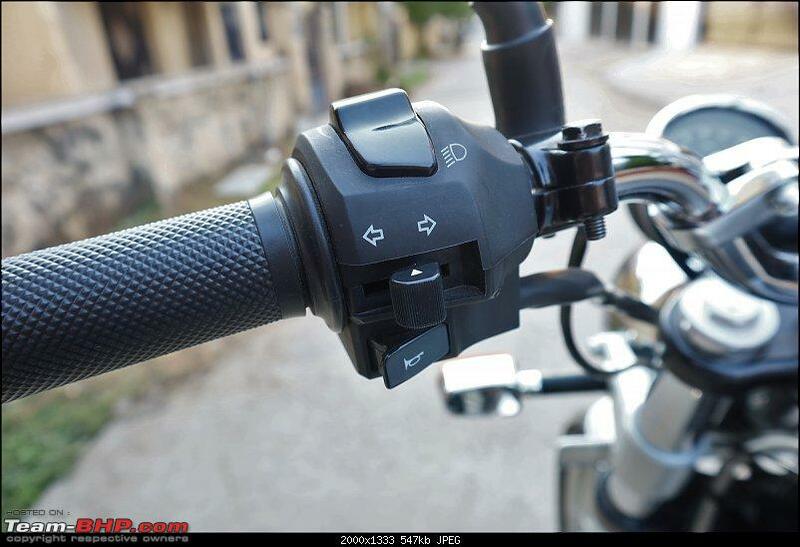 Otherwise the slip assisted clutch lever feels light and makes life easier in b2b traffic. 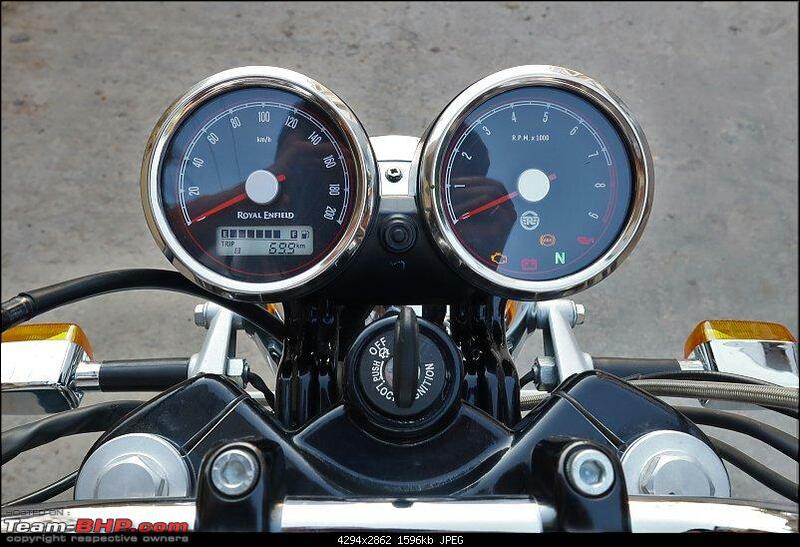 In 6th gear it does 80kmph@3200rpm and 100kmph@4000rpm. Weird! I absolutely loved the clutch and gearshifts on the RE 650 twins - they were precise and along with the slipper clutch - reminded me of the brilliant Duke 390 while rushing down the gears. Far better than my own motorcycle - the Versys 650. Hopefully settles over time. That said - I remember that 100kmph was 4500rpm in 6th. Thanks. 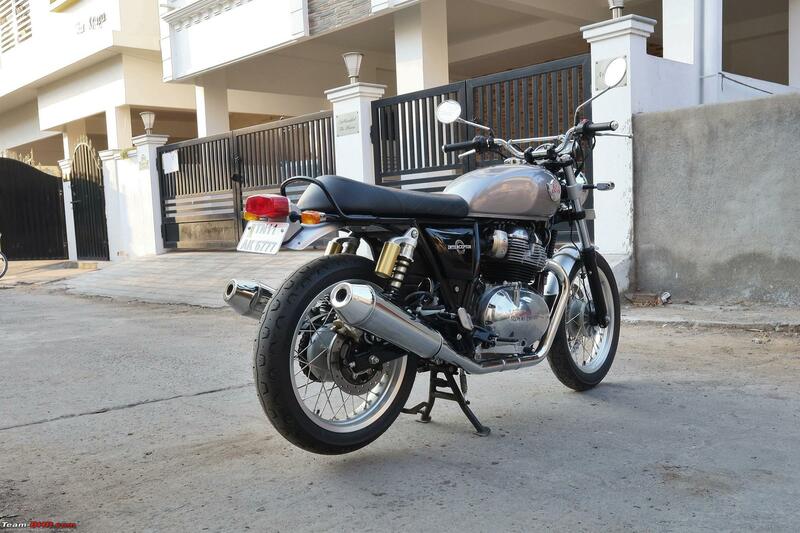 The Z250's ownership review is already shared by my brother here in the forum (Calista aka Flying Raijin - Ownership review of my Kawasaki Z250). 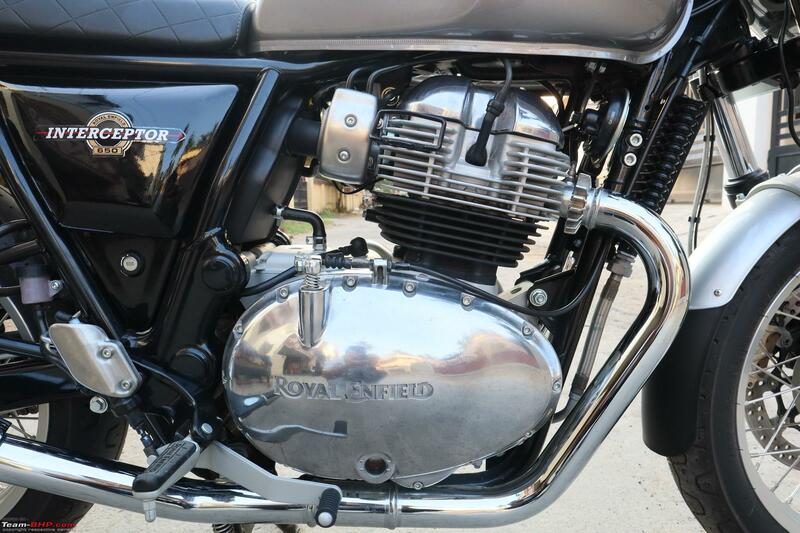 It's a beautiful motorcycle with that gem of an engine which loves to rev to it's 13,000rpm redline! Even I was startled at the beginning with the gearbox behavior and did a recheck with your first ride report and the others in forum and was surprised to see nobody experienced this. Now it feels better though, will closely monitor. 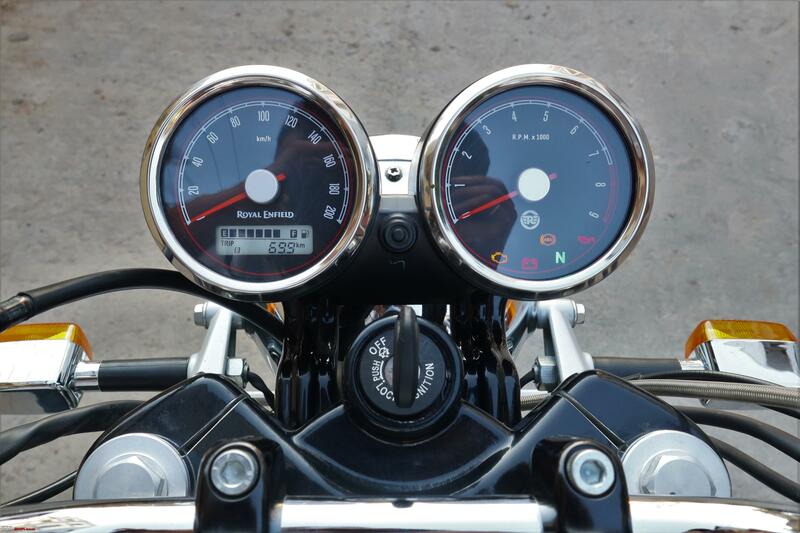 Well, I checked again today on my way to office and the bike did 100kmph@4000rpm in 6th gear, or may be close to 4100rpm to be precise. Weird indeed. I think this is a great bike for what it offers as a package. 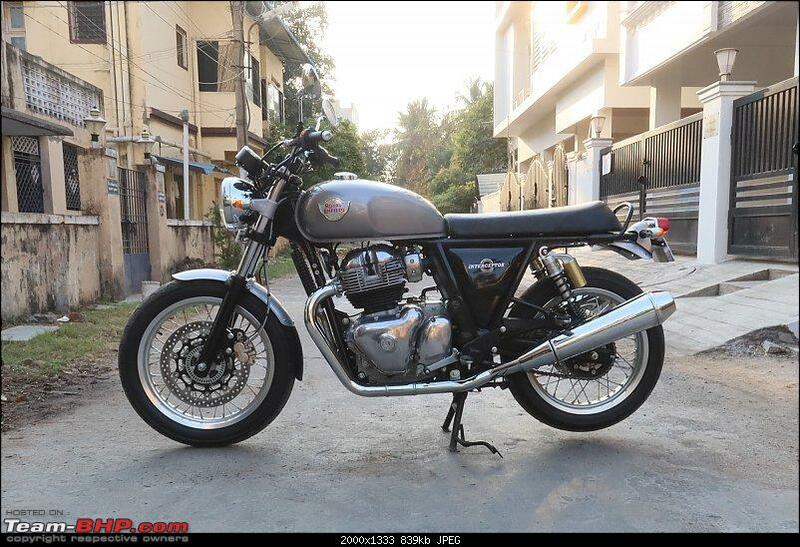 I've been following threads of many high end modern classic bikes and all I can say is that the number for "niggles per lakh spent" on the Interceptor isn't very different from the others and hence seems like a sensible buy. Look forward to your experience. I've put my Baker Express on hold despite being offered delivery because I couldn't get over the front foot-peg issue. But outside of that, I was always super impressed by this bike. I am currently looking at the possibility of getting a CGT650 and retrofitting it with a different handlebar. My only concern here is the wire spokes wheel set up which attracts unforeseen puncture and with the several ongoing construction projects all over Chennai things doesn’t look encouraging. Wrong notion, Spokes are more robust than they're given credit for, also to note is the misconception of Spokes being unreliable in comparison to alloys, and by no means 'attracts' punctures. 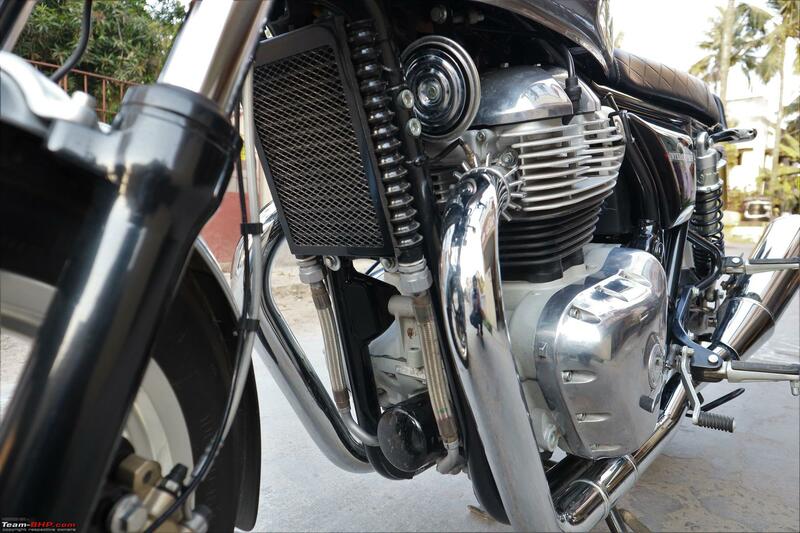 On the contrary, if you rip the motorcycle on a broken stretch, then the tube setup holds air better than the TL setup as on hard landing/bashing TL's loose air which eventually results in a puncture or the alloy bending/cracking which would render you stranded. In comparison if you're selective about the tube you use and replace them along with the tires as soon as their recommended life is up, then you have a setup that can absorb any brutality you can throw at it without getting you stranded. As for punctures that happen in-spite of you doing your part, being able to plug a puncture instantly i,e provided you're carrying an inflator and TL repair kit with you, can seem alluring but that is just part of the story. As for the issues you've reported with Shifting, they're not issues per say as that is how any constant mesh transmission tends to shift. It would get better with use and fresh engine oil. As for Speed vs RPM, with more clutch wear speed per RPM reduces i.e the motor would be doing more revs to attain similar speeds. Last edited by ashwinprakas : 22nd March 2019 at 12:18. This is the ownership log of my Royal Enfield Interceptor 650 Twin. Will update regularly and keep this thread live and active..
Torino mah Man!! What an amazing report!! Congratulations on both the motorcycle and on your abilities of articulation. Brilliant work I say!! Coming back to the substance of your write-up, you have given me food for thought. I am always thinking about a bigger bike. I followed the 650 twins closely until launch, and then lost interest because of less than impressive first hand reports. 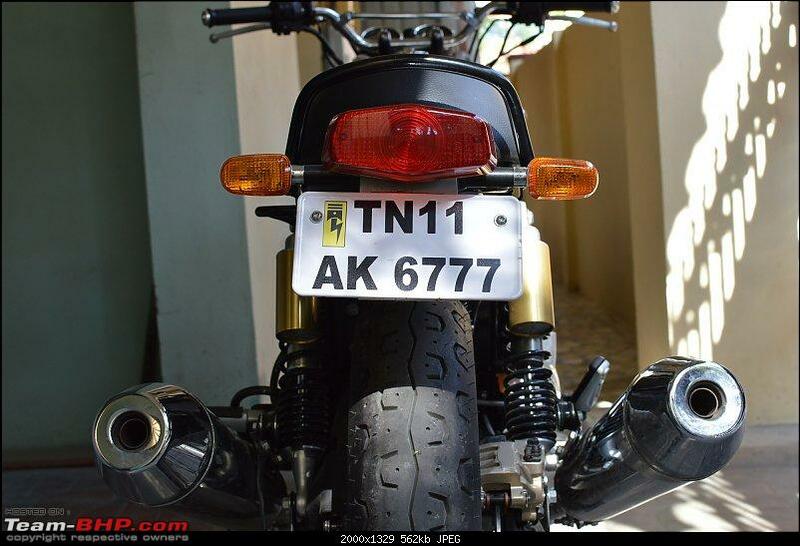 Now your thread has given me reason to reopen the file on this motorcycle. However an year or so after coming back to motorcycling, I have realised that there are some features that I absolutely need. A clock is one of them. Also on that list are a gear position indicator, a mobile charging port near the handlebar, hazard lights, and the ability to easily install auxiliary lights. Still I think I will keep the Interceptor on my radar and watch this thread. Maybe over time, I will find a way to get past my criteria. Incidentally, on the matter of those front foot pegs, you'd be interested to know that you aren't alone. 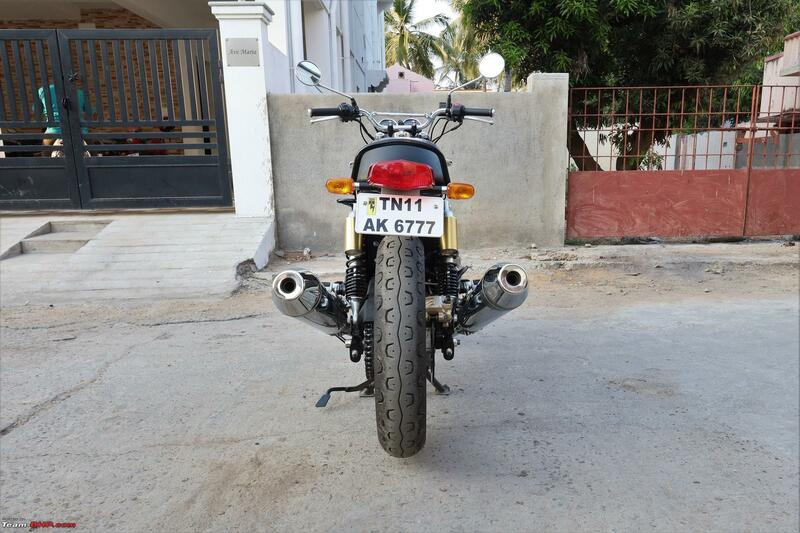 Indians of average height suffer through the same problem on other bikes, like the Dominar for instance. 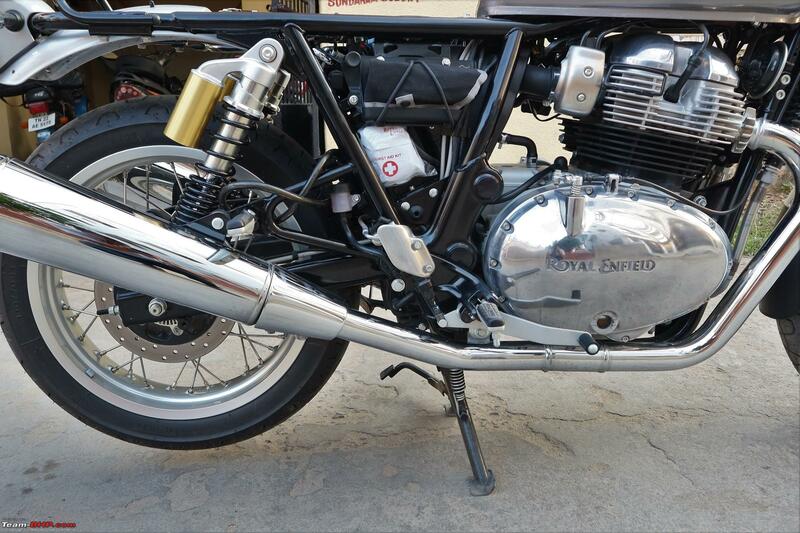 Just when I think Ive gotten over my undying love of the silver Interceptor and can safely walk in and out of a Royal Enfield showroom without booking one, this thread comes up and makes me go weak in the knees all over again. 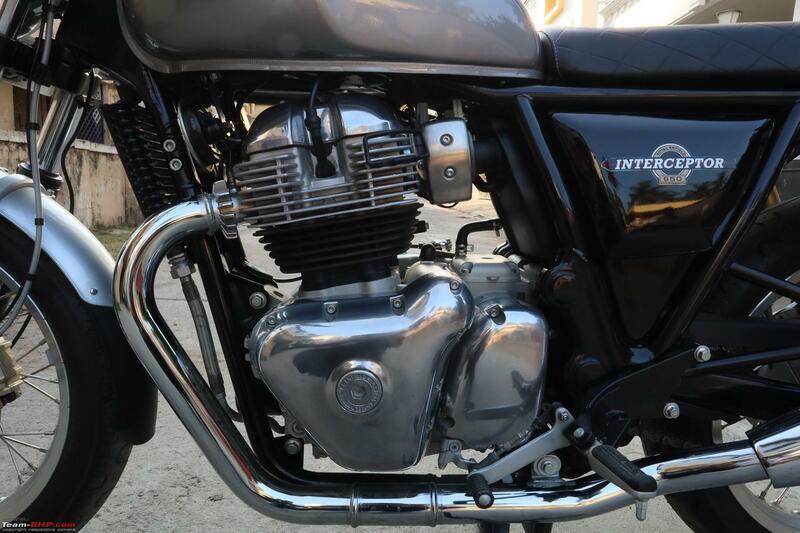 Congratulations on your Interceptor, it certainly is a lovely motorcycle indeed. 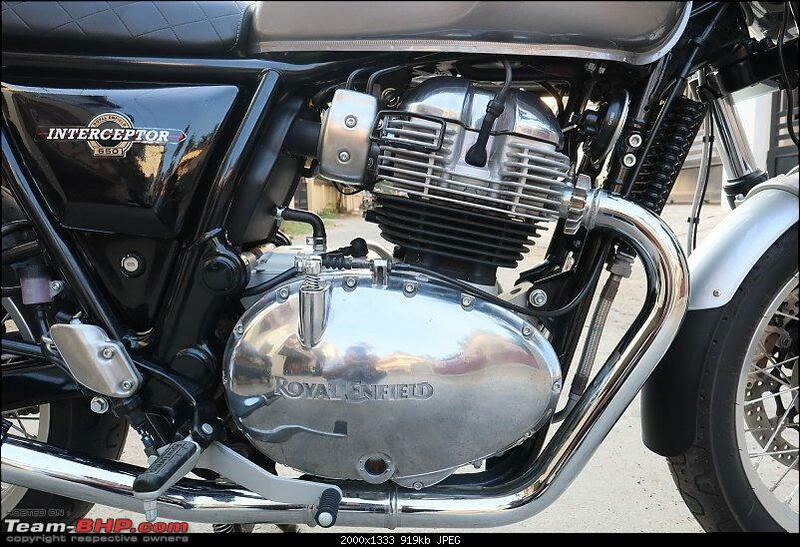 I was under the impression that the on road price of the base Interceptor was Rs 2.99 L pan India. I didnt realize that it was only Rs 2.89 L in Madras. Multiple Continental GT 535 owners (including myself as documented on this forum) have done handlebar modifications to get an easy and upright seating position. Any good mechanic will be able to do it for you. Hi Neil, Thanks for pointing this out. I have a quick question about this - Are the foot pegs of the CGT 535 as rear-set as the CGT 650's? If yes, can you please comment on the riding dynamics post the mod? I've tried to get a test ride of a CGT 650 with INT's handlebars from multiple dealers, but none have acceded! I think this is a great bike for what it offers as a package. 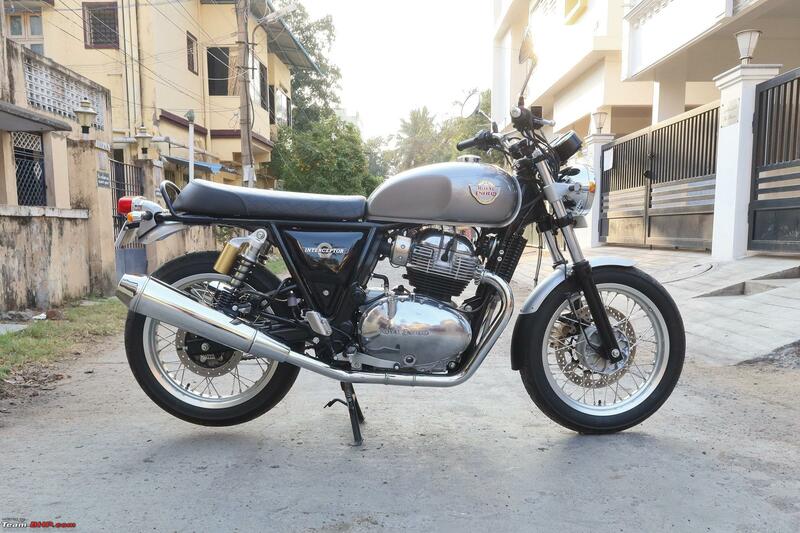 I've been following threads of many high end modern classic bikes and all I can say is that the number for "niggles per lakh spent" on the Interceptor isn't very different from the others and hence seems like a sensible buy. Thanks for the reassurance. 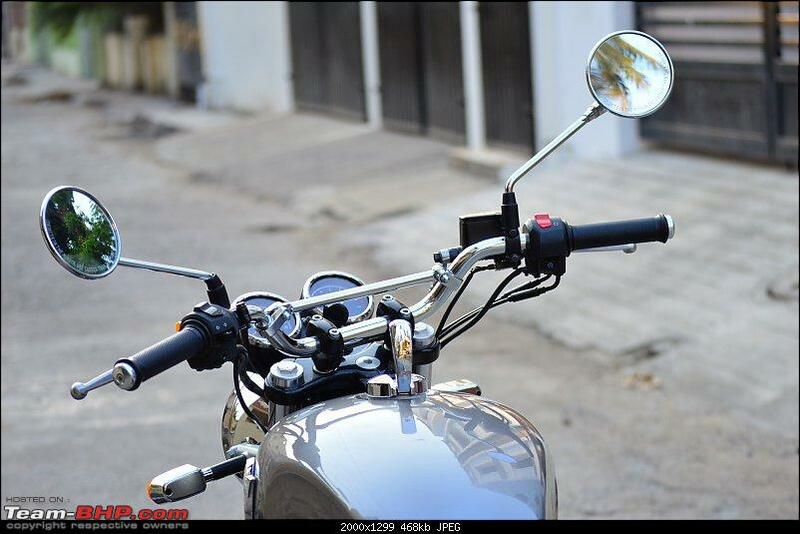 It is very much possible to retrofit the handlebar and I have seen few CGT535s with KTM Duke's handlebar, looked neat. Wrong notion, Spokes are more robust than they're given credit for, also to note is the misconception of Spokes being unreliable in comparison to alloys, and by no means 'attracts' punctures.As for Speed vs RPM, with more clutch wear speed per RPM reduces i.e the motor would be doing more revs to attain similar speeds. Thanks A.P. I think I should have explained better. My concern is that the wire spoke wheel renders the tubeless tyre ineffective hence one the account of puncture the bike instantly becomes unrideable which is not the case in alloy wheels. I am aware of the pros of wire spoke wheel and tubed tyre. Yes, I did observe marginal improvement in shift quality soon after the first service with fresh oil. I have to give it some time to set in. Probably you are right about the clutch wear, shows how much the test ride bikes are taken to their limits in such a short time. Torino mah Man!! What an amazing report!! Thank you Mohan. That's a nice list of features you got there and probably you can get all of them from the accessories market once the bike becomes more popular. 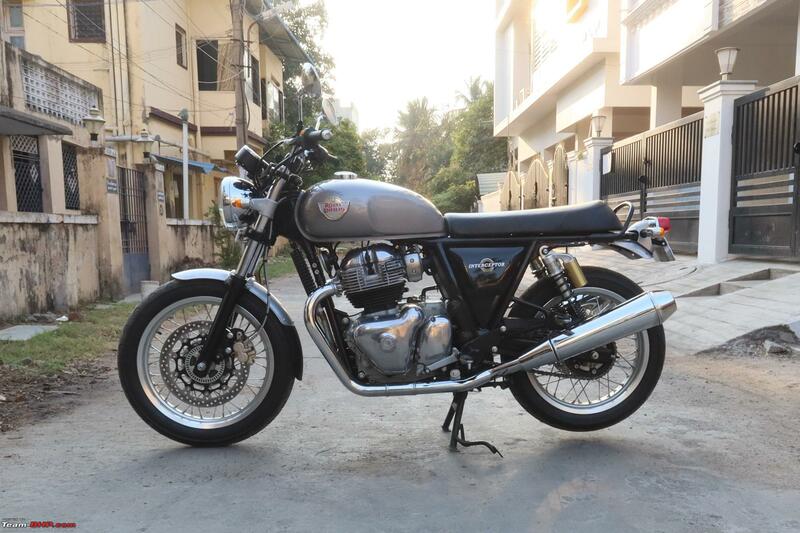 Just when I think Ive gotten over my undying love of the silver Interceptor and can safely walk in and out of a Royal Enfield showroom without booking one, this thread comes up and makes me go weak in the knees all over again. Thanks Jericho. 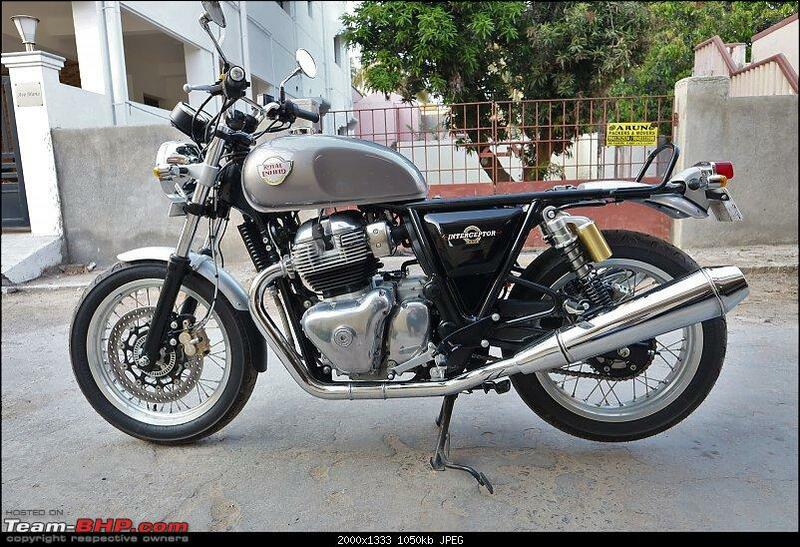 I think this shade of silver blends with the rest of the bike to make it look classier. Very crisp and informative report, thanks for sharing! I intend to get one post monsoon, that's my litmus test. The pillion foot pegs are a real mess - should have been a little ahead and lower. This is one of my tasks in the to-do list. Why dont you try Slime for the tires? The bike I tested was fresh off the block. First test ride from the dealership - so wear and tear of the clutch is quite unlikely. Secondly, I took TD from 4 separate dealerships. Anyways - a friend has the new Interceptor 650 as well. Will check and confirm. All times are GMT +5.5. The time now is 12:02.